Some people are just all around good, and Dr. Robert Manasherob is one of them. Not only is he a world class microbiologist, but he is a first rate historian and researcher in Israeli and Arab armored vehicles. While personally I am not into microbiology, I do follow Soviet armor and thus am glad he decided to write this new series and share his knowledge with us. The book comes out at a very fortuitous time for modelers, as Trumpeter of China is releasing new state-of-the-art kits of the T-62 Model 1962 and T-62 Model 1972 tanks. As most of the Arab armies were equipped with either Model 1967 or Model 1972 variants of the tank, this book will provide an invaluable assist to anyone modeling either Soviet or Arab T-62 tanks. Dr. Manasherob begins with an overview of the 1967 and 1973 wars and why this tank was such a threat during the ‘Yom Kippur’ war. He then goes into a short history of the creation of the T-62 tank and how it evolved from the T-54/T-55 designs. Basically he notes that it used the hull of the IT-1 (Ob”yekt 150) missile armed tank destroyer with a new turret and the U-5TS 115mm smoothbore gun to create a tank which the Soviets felt was superior to the Centurion, M60 and Leopard 1 armed with the British L7 105mm gun. As the Israelis had reequipped their Centurions with the L7 gun and also mounted it in their M48 tanks to bring them up to M60 levels, it was only natural that the Arab armies would seek out this tank to give them an edge in combat. From this point on the book switches to photographic coverage of the Syrian and Egyptian tanks which were knocked out or captured during the course of the 1973 war. This constitutes three-quarters of the book and provides a tremendous amount of detailed photos of both destroyed and captured vehicles, to include their tactical markings and camouflage. My only disappointment here was that none of the divisional/brigade markings are covered, which as they are quite colorful is a shame. Like the Iraqis, as a large number of the Syrians were semi-literate most of the markings consisted of colored geometric shapes and specific colors for each unit and subunit. The Syrians used a number of split circles and triangles in these two divisions but unfortunately no coverage is provided of these markings. The tactical markings, most consisting of 5XX turret “bort” numbers, is given prominence. Of great use to modelers are three complete sets of plans of T-62 tanks: one Model 1967, one Model 1972, and a Model 1972 with the complete fittings for KMT mine trawls (mine clearers) in place. The last is a bit unfortunate, as it is actually a Model 1967 tank and to add to its misfortune the draughtsman got the gun barrel to pass UNDER the glacis splash plate! Other than those minor goofs, the plans are very well done and of great use to anyone modeling a Model 1967 or Model 1972. The book concludes with 30 pages of color shots of T-62s from the Latrun museum and combat shots followed by eight paintings of Syrian and Egyptian tanks from the 1973 war. For some reason there are about 75 photos of T-62 wheels, and while it shows both intact and burned out wheels why so many were included escapes me. The book contains at least 300 good clear photos of T-62s, and with the two good sets of plans (and the position of the mine clearing mounts is correct so they are also of use) it should be part of any T-62 modeler’s library. 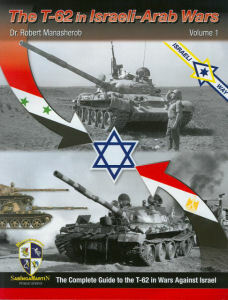 Overall this a nice, clearly written and very well illustrated book which is of use to both Arab-Israeli and Soviet armor fans. Thanks to Bill Miley for the review copy.